"This sauce is from the very popular 'chicken bowls' in my hometown. It's very tasty! Use it as a marinade for chicken, or to baste chicken while grilling. Increase the hot chile paste as desired. Four tablespoons is usually as much as anyone can take!" In a medium saucepan over high heat, whisk together the sugar, soy sauce, water, onion powder, and ground ginger. Bring to a boil. Reduce heat to low, and simmer 5 minutes. Remove the mixture from heat, cool, and whisk in lemon juice and hot chile paste. Place chicken in the mixture. Cover, and marinate in the refrigerator at least 4 hours before preparing chicken as desired. 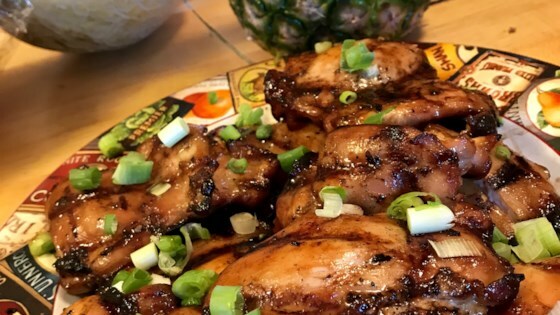 See how to make sweet and tangy, Asian-inspired BBQ chicken wings. I wasn't crazy about this one, I just can't put my finger on what needs improvement. Try the Japanese Chicken Wings recipe on this site as a marinade/rice bowl sauce. I like this recipe, but it needed some sesame seeds, sesame oil, and green onions. With those ingredients added, this recipe is perfect!